Jesus says to the young man, "You lack one thing, just one. If you would be perfectly happy, go home and sell all that you have, and give your riches to the poor people. Then you will have riches in heaven." HILE JESUS WAS teaching the people in a country place not far from the Jordan River, some mothers brought their little children to him and asked him to bless them. Jesus loves little children, so he took them in his arms and put his hands upon their heads and prayed. But the disciples stood by looking much displeased. They called the mothers aside and said, "You should not trouble our master in this way, for he has more important work to do than to caress your children!" And no doubt the mothers were grieved to hear them speak these words. Jesus, too, was grieved with the disciples. He said, "Do not forbid the little children to come to me, for of such is the kingdom of God. Whoever of you will not receive the kingdom of God just as a little child, can never enter into it." And again he took the little ones in his loving arms to caress and to bless them. Jesus knew that little children would gladly believe him and that many times they could lead older people to believe in him, too. He knew their little hearts were tended and quick to respond to his love, while older people were more ready to doubt and to question whether or not he was the very Christ. Then Jesus rose up and went with his disciples to another place. And as he went a young man came running to meet him. This young man was very rich, and he wore beautiful clothing. But he knelt down in the dust before Jesus and said, "Good master, what good thing shall I do that I may receive life in the other world?" "Why do you call me good?" asked Jesus, adding, "for there is none good but God. You know the commandments--'Do not kill'; 'Do not steal'; 'Do not speak falsely'; 'Honor your father and your mother.'" "Yes, I know the commandments of Moses," answered the young man, "and I have kept them from childhood. But I seem to lack something yet. O Master, tell me what it is!" Jesus looked tenderly into the anxious face of the young man before him, and he loved this man. He longed to help him. But he knew the one thing that hindered this man from being contented and happy. He knew the one thing that stood between this man and the hope of life in the other world. Just one thing; but unless that one thing should be taken away, the rich young man could never enter heaven. So he said, "You lack one thing, just one. If you would be perfectly happy, go home and sell all that you have, and give your riches to the poor people. Then you will have riches in heaven. Afterwards you may come back and be my disciple." What a change came over the young man's face when he heard these words! His head was bent forward, and he walked very slowly away, for he was sad and deeply troubled. Jesus watched him go away, and Jesus, too, was sad. 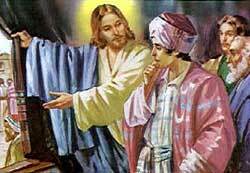 Then he turned to the disciples and said, "How hard it is for rich men to enter into the kingdom of God!" He knew this young man loved his riches more than he loved God, and that he was unwilling to sell his possessions and give his money to the poor. Because he loved his riches he could not be contented and happy, for his heart was not right in God's sight. Always he felt that something was lacking, that something clouded his hope of life in heaven. But he turned away from Jesus, choosing rather to be rich in this world than to be a disciple of the Lord. Afterwards he found out that he had made an unwise choice, for riches never satisfy.